We and this website comply with the DPA (Data Protection Act 1998) and with the GDPR (General Data Protection Regulation) which comes into effect from 25th May 2018. We will update this policy accordingly after the completion of the UK’s exit from the European Union.  Sending subscription notices to you.  Recording financial transactions to your subscription account.  Contacting you with relevant club correspondence.  Maintaining a record of any competitions you play in.  Maintaining a record of your handicap and related CDH Number.  Providing you with a Member’s Card for gaining access to the club and discounted bar facilities.  Confirm your handicap to other Golf Clubs if they request confirmation of your handicap for any competitions you have entered with them. Royal Dornoch Golf Club will retain your personal information on our club membership database for the duration of your membership. We take your privacy seriously and all such information is held on secure servers. 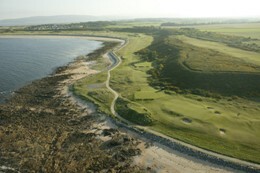 Royal Dornoch Golf Club complies with all applicable Data Protection Regulations. We may change this policy from time to time by updating this policy and will notify you accordingly.